Frankie Nelson of Swanton fires up a three-pointer during Tuesday’s non-league matchup with Pettisville. She helped the Bulldogs’ cause with 10 points, as they defeated the Blackbirds 61-45. 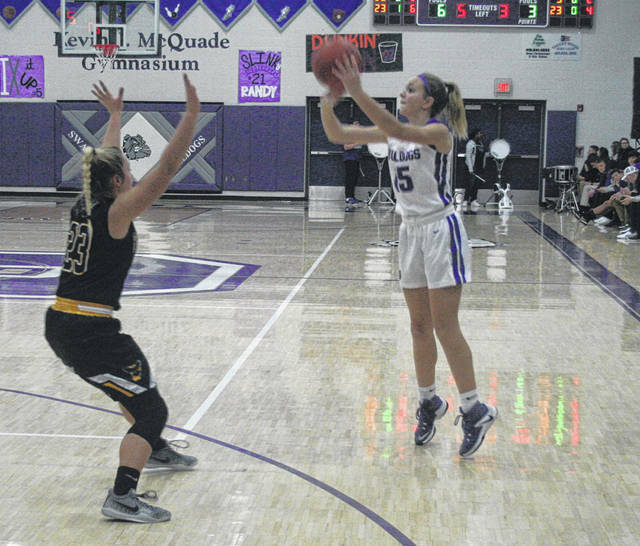 Swanton grew its lead steadily throughout the game and behind a 65 percent (11 for 17) shooting effort from beyond the arc, the Bulldogs defeated visiting Pettisville 61-45 in girls basketball Tuesday night. “We came out hot, and the girls shot the ball great,” said Swanton mentor Eric Oakes. “I don’t know how many threes we had in the first half, but we had more than we’ve had in a game obviously. Just shooting it in rhythm. We were squared up and shot the ball well. The Bulldogs were first able to get the lead to double digits near the end of the first half. Pettisville’s Jessica McWatters brought them within nine, 27-18, by hitting a three-pointer at the 2:47 mark. However, the Dogs got a pair of free throws from Ashlynn Waddell and then a corner triple from Frankie Nelson, extending their lead to 32-18 at the half. Swanton got a bucket on a backdoor cut by Aricka Lutz, then Averie Lutz hit from long range for a 19-point difference nearly three and a half minutes into the third quarter. They held a 19-point lead on more than one occasion in the third, until the Blackbirds’ Morgan Leppelmeier got going at the other end. She had eight points in the period and 18 total in the second half, compared to just four in the first half. Leppelmeier tallied eight in the first 3:15 of the fourth, plus an Elizabeth Beck triple helped trim the Bulldog advantage to 50-39. However, Swanton responded with a 9-0 run. Aricka Lutz got it going with a three-point play, then Pine scored but missed the and-one opportunity, Aricka Lutz converted a steal into points and Pine hit two free throws, essentially sealing the win by going up 20 with only 2:21 left. Leppelmeier did lead all scorers with 22 points. Aricka Lutz had 20 points for the Dogs, Averie Lutz chipped in 13 and Nelson 10. The Dogs won the rebounding battle 24-22, while also forcing 16 Blackbird turnovers. Swanton (6-5) travels to Evergreen Thursday for a Northwest Ohio Athletic League contest.